Medieval England comes beautifully to life in this understated point-and-click adventure. What is it? A historical adventure set in medieval England. Whether it’s rewinding time, surviving a zombie apocalypse or becoming a famous pirate, adventure games tend to hinge on a specific theme or gimmick. And that’s what makes The Pillars of the Earth so refreshing. It’s an understated story about ordinary people, with a rich setting based on a fascinating and rarely explored period of history. The result is a game that is, admittedly, not as immediately thrilling as some, but that rewarded my patience with one of the deepest, most mature stories I’ve ever encountered in a videogame. The pace is glacial and the mood is almost unrelentingly downbeat, but you soon settle into its peculiar, steady rhythm, and I found myself wishing more games were as confident to just slow down and give the story room to breathe. 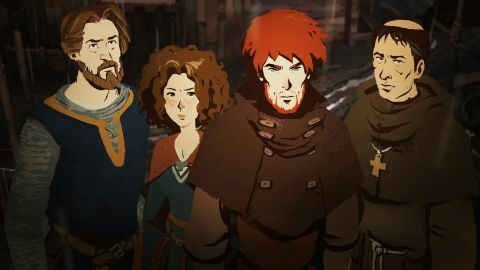 Based on a novel by Welsh author Ken Follett, the game is set in England in the 12th Century, telling the story of the village of Kingsbridge over a number of years. War, poverty, and corruption are rife in this period, known historically as The Anarchy, and we see three very different characters’ lives unexpectedly intertwined by the turmoil of the era. There’s Philip, a devoted monk in over his head; Jack, a boy raised by his mother in the woods; and Aliena, a noblewoman whose family has been disgraced. Split into three episodes, all of which are available now, the story hops frequently between different points of view. You’re introduced to Philip as he visits Kingsbridge in the wake of its Prior’s death, finding the village poor and destitute, and the abbey falling to pieces. Meanwhile, Jack and his mother struggle to get through a tough winter in the forest, when a chance encounter with a family changes their lives forever. And Aliena, who is being held prisoner in her own home, plans a daring escape. Pillars of Earth is strikingly atmospheric. The painted backgrounds are wonderfully detailed, bringing snowy forests, rolling farmland, grand cathedrals, and bustling cities to life. Artful use of light and shadow, and subtle moving details such as gently falling snow and flickering candles, give the world a vivid sense of place. Medieval England was not a pleasant place, but there’s beauty in the bleakness. The characters are just as well-realised, with impressively nuanced animation and big, expressive sprites relaying a lot of personality. The sound design is also fantastic, particularly the howl of the wind echoing through the cavernous abbey in Philip’s introduction. The voice acting is superb too, which is a good thing as you spend much of the game in conversation with people, choosing how to respond and shaping their opinion of you. A timer ticks down as a character awaits a response, giving arguments and other fraught encounters extra tension. I also like how Philip can respond to people by reading from the Bible he carries around everywhere, defusing situations by quoting scripture. Like many narrative games, the larger story follows an unavoidably prescribed path. But you can dramatically alter your relationships with people, and steer other events, along the way. And at the end of each chapter you get a summary of your decisions, which is worth taking a screenshot of to remind yourself, because there are a lot of small, seemingly innocuous choices that can suddenly resurface later on. Fans of Follett’s original book (or even the Ridley Scott-produced TV adaptation) will enjoy the chance to reshape some key moments from the story. While Pillars is indeed a point-and-click adventure with character movement, exploration, and object interaction, anyone expecting something heavily puzzle-focused like, say, Broken Sword will be disappointed. There are some simple environmental puzzles here and there, and a few rare QTEs, but story and dialogue take precedence. This suits the game’s grounded, realistic tone, however, because having these characters wandering around combining random objects would have just felt a bit silly. While Pillars deals with religion, politics, and war, and uses the complicated real history of The Anarchy to flesh out its setting, the characters keep the story grounded and relatable. Nothing else on PC tells a story quite like this, and although it will be a hard sell for some, the slow pace is worth persevering with if you value storytelling above all. Sometimes it slows to the point of dullness and interaction is limited at best, but I loved immersing myself in this evocative medieval world.